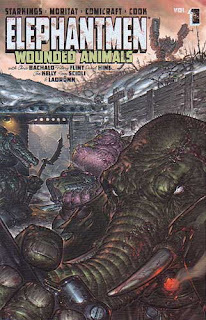 In honor of the Richard Starkings signing at the Comic Bug (my local comic shop) in Manhattan Beach, California today, his Elephantmen: Wounded Animals collection is the comic of the day. Elephantmen: Wounded Animals follows engineered creatures who were created by the mixing of human and animal DNA. The creatures were used as weapons in a future war and then later released into society. They, being "freaks," have no true place in the world of man and are thus treated as third class citizens. It is basically a story that plays off of the themes of human misunderstanding and non-acceptance. It is racism to the extreme, or like being a mutant in the world of Marvel. A weird looking mutant. Nightcrawler or Beast. Wounded Animals introduces the characters of Elephantmen with brief histories. The volume, which collects the first 7 issues, leaves you wondering what else is in the characters' pasts and what their intertwined futures will have in store. I guess a good comic leaves you always wanting more. What else has Starking done in comics you may ask. Oh not much...just about everything! He grew to fame with his lettering career which includes the two greatest Batman stories ever: The Long Halloween and The Killing Joke. Plus, if you haven't seen the man draw you should stop into the Comic Bug tonight. He is participating in a pictionary competition: artists vs. comedians. Check out the ol' hat, beard and glasses himself sketch a mean image or two. I spoke with Starkings (he is a regular at the Comic Bug) and mentioned to him that I love Elephantmen: Wounded Animals because of his excellent paper choice. The paper in other trades can wave a bit due to moisture in the air. Being in a beach city, this can be a problem. But Starkings told me he purposely asked for the thicker higher quality paper for reasons such as this. A man who thinks of everything, Starkings' book is the sharpest looking trade on any bookshelf.